The City of Newark was built along the banks of the Passaic River. In 1983, the Ironbound neighborhood was one of the first in the nation to be designated as a “superfund site” for dioxin along the Passaic River. The Ironbound, named for the metalworking industry or from the network of railroad tracks in the neighborhood, is multi-ethnic, highly diverse, and working-class, where English, Spanish and Portuguese are common. It’s been called “Dutch Neck,” “Down Neck,” or simply “Neck,” due to the curve of the river. Industry developed along the river, cutting human connection and views to the river. Over time hardly anyone knew it was there. Most residents still think of the river as highly toxic. 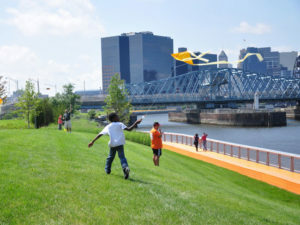 Alongside efforts to clean up the river, ICC has a 30-year history in advocating for the development of parks along the river to provide access to a riverfront that had been off-limits due to pollution for over a century. In 2012, after years of community based planning, advocacy and fundraising, ICC celebrated the opening of the first 15-plus acres of the beautiful new Riverfront Park. The ICC is skilled at building partnerships. Over time, they have hosted dozens of community meetings and charettes to solicit input from residents about their vision for the river and the riverfront parks – including programming and educational activities and events on the waterfront. Workshops are frequently held for residents on river stewardship, stormwater management, fish advisories and general strategies for ecological restoration and environmental improvements. These cover the current condition of the River (which is surprising to most residents—because the condition is better than they expect! ), as well as information on how to access it and improve its condition over time. In partnership with the City of Newark, ICC held over 30 boat tours in the summer 2013 opening of the park, with hundreds of people participating. People were thrilled that they could experience the river in a new way. “Walking Workshops” or “walkshops” were targeted to young people and a diverse base of residents throughout the region. These “walkshops” were focused on a series of observations of the river. It was the first time many of the young people and residents were able to safely enjoy the river, watch blue heron and mallards, and see an ecosystem before their eyes. The day of the park opening, people walked to the water from their various areas of the city with signs “Walk to the Water—Central Ward” (South Ward,etc). ICC has informed and empowered residents who continue to fight to make sure that the river is cleaned up and the waterfront is accessible to all residents. Three decades later, ICC still monitors this issue while embarking upon a community-wide waterfront vision to restore the river for recreational and ecological purposes. When there is a diverse population, it is critical to cater to the residents by publishing flyers in the languages that are heard in the community – English, Spanish, Portuguese, etc. – and always have translation available. As with anything new in a community, even if it’s an amenity, people are slow to access or enjoy a new site. It is therefore extremely important to have a broad range of activities over an extended period of time to bring people to the amenity. Founded in 1969, Ironbound Community Corporation (ICC) has been involved with efforts to revitalize the Passaic River for decades. They were founding members of an advisory group for superfund cleanup. Dioxin-contaminated land in Ironbound was cleaned up in 1986, but river clean-up did not begin until 2012. ICC strongly advocated for local jobs and over a dozen Ironbound residents were successfully trained and employed in this process. ICC continues to facilitate community involvement in the clean-up and received the EPA Region 2 Administrators Award for Excellence in April 2014.